Dr. Jorge Rodriguez has been practicing internal medicine for over 30 years and is the author of the best-selling book, The Diabetes Solution. 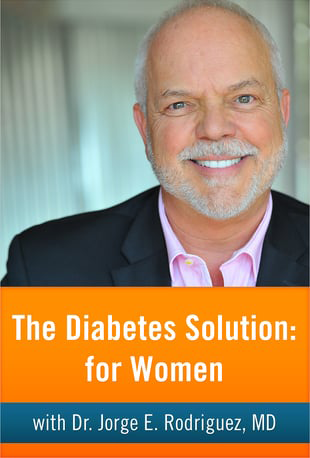 Because of the staggering statistics on how many women have, or are prone to get, Type 2 Diabetes, Dr. Jorge has created the The Diabetes Solution for Women–a one-of-a-kind course that you won’t find anywhere else. In this course, you’ll learn the basic diabetes info you need but, more importantly, Dr. Jorge will teach you everything you need to know about how Type 2 Diabetes affects you as a woman.Knowledge is power and power is good health. This video course contains the opinions and ideas of the authors of the book The Diabetes Solution: How to Control Type 2 Diabetes and Reverse Prediabetes Using Simple Diet and Lifestyle Changes by Jorge E Rodriguez, MD and Susan Wyler, RDN. The reader should consult his or her medical, health or other competent professional before adopting any of the suggestions in the video course or drawing inferences from it. The authors and video producer/distributor specifically disclaim all responsibility for any liability, loss or risk, personal or otherwise, which is incurred as a consequence, directly or indirectly, of the use and application of any of the contents of the video course. For recipes, doctor visit checklists and more download the course PDF, free!